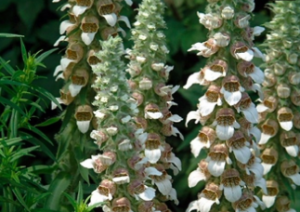 Wooly foxglove is a vigorous and indispensable perennial for areas ravaged by deer. Native to the mountains of Greece it sends up remarkable 3′ spires with fascinating intricate flowers. 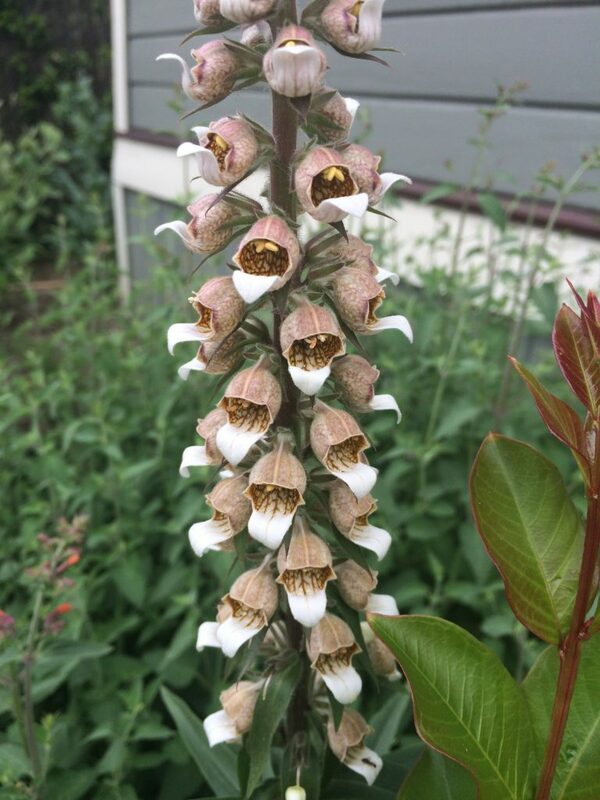 Each spikes is tightly packed with small tubular flowers that have a brown/amber netting pattern on the outside. In the front of the flower a prominent white lip protrudes. The symmetrical effect of all these flowers is grand and individually reminiscent of an orchid. Part shade to full sun in rich, well drained soil with light but consistent summer water. Forms spreading rosettes to 2′ across in a short amount of time. Semi-evergreen in winter. Supremely tolerant of deer browse- they rarely even mess with this stately easy to grow perennial. Average lifespan 5+ years. The mid green handsome leaves are finely coated in white fur.